One of the most underappreciated landscaping home improvement projects is the simple addition of stepping stones to your garden and Fort Worth lawn areas. 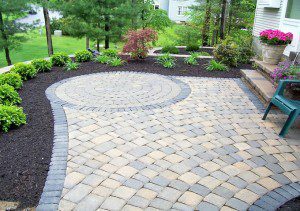 Stepping stones are an easy way to add texture, contrast, and convenient pathways to your landscaping design. If you’re looking for a low-cost, attractive, landscaping addition to your property, the world of stepping stones is one you ought to explore with your Fort Worth lawn care provider. Any type of landscaping is going to add value to your property, both fiscally and aesthetically. Stepping stones in particular give your landscape texture, dimension and color. A professional Fort Worth lawn care company will be able to offer up creative ideas when it comes to design using whatever type of material you think will fit the current or intended motif of your property. Stepping stones typically come in natural stone and pavers. Natural stone includes flagstone, slate and sandstone, all which can be cut to your specifications. Installing natural stone paths in your landscape can also help minimize trampling of delicate grass and compacting the soil beneath. Stone pavers are able to be interlocked, which gives a homeowner the option of having a continuous pathway instead of intermittent stones. These are also less costly than their natural stone counterparts. If you’re looking for a more consistent design, stone pavers are also a more ideal selection. Whatever your preference, your local Fort Worth lawn care company can make sure your landscape becomes exactly what you want and within budget without a long, complicated landscaping project.